Purchase Ready to Ship Sign Supplies Today! We Have This and Other Popular Models In Stock Right Now! 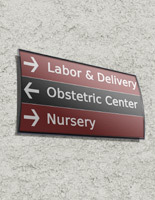 These Sign Supplies Are Great For Directional Signage! 2.5" x 8.5" 3" x 4" 3" x 5" 3" x 8" 3" x 11.5" 3" x 15" 4" x 5.5" 4.5" x 24" 5.5" x 6" 5.5" x 9" 5.5" x 15" 6" x 7.5" 6" x 8.5" 7.5" x 10" 7.5" x 11.75" 8.5" x 11" 8.5" x 16.5"
Fabricated from anodized aluminum extrusion w/ plastic end caps for years of use. 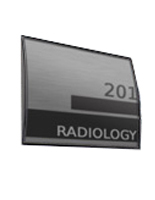 These commercial sign supplies designed for business displays incorporate a black, anodized metal backer for durability. Directory exhibit signage, like the merchandise observed at this site, have a curved design to grab attention. 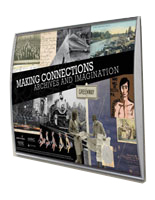 Every poster frame includes a non-glare lens to shelter prints from dust or other conditions from blocking the sight of these exhibited signs. These directory exhibits, sign supplies do not include printed images. Nevertheless, clients can effortlessly prepare their own images on any ordinary printer. 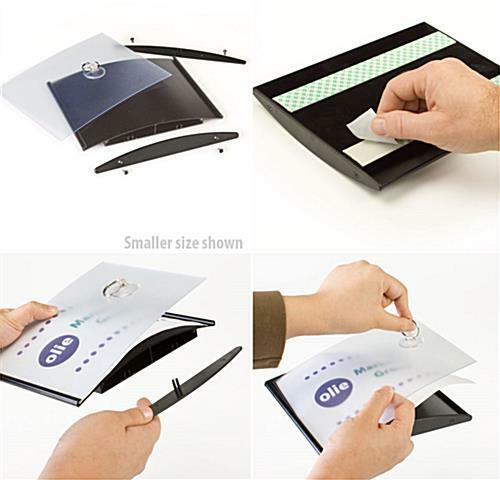 Printed images can also be effortlessly amended and revised by utilizing the supplied suction cup. The suction cup allows buyers to swap out posters without having to take away their signage from the wall. 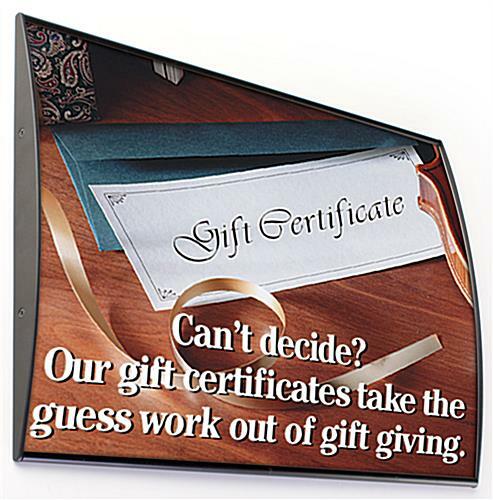 The sign supplies include two strips of double-sided VHB tape on the back for buyers to quickly mount signs on the wall. 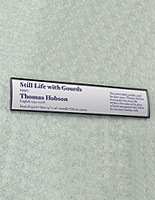 The sign supply can be exhibited vertically or horizontally on any flat surface area. These discount sign supplies for sale at an affordable price are an ideal addition to any business. 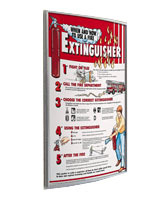 These sign supplies, called a workplace signage, are utilized in numerous business environments. 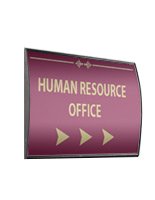 These signholders are often used for identifying rooms like "meeting Area" or "Human Resources Workplace." 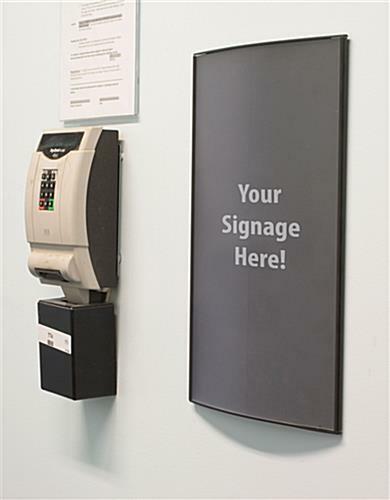 Sign supplies are even utilized to guide patrons and guests to a precise location, like "Optical →," pointing patients in the right direction. 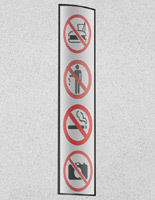 This workplace signage is also suitable for exhibiting warning signs for safety issues like "Emergency Exit" or "No Smoking." 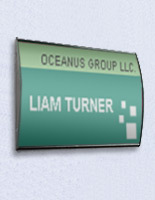 Sign supplies can help stop patrons getting lost, and discover the office they are searching for. This merchandise is also excellent for promoting signage or advertisements in any sales or commercial shop environment.